The King Sisters began working as a separate act, appeared regularly on the radio program The Ozzie And Harriet Show , and continued to record for RCA/Bluebird. Thirteen of their records were in the top 30 between 1941 and 1945, with "It's Love, Love, Love" charting for 11 weeks in 1944 and peaking at number 4 in April of that year. 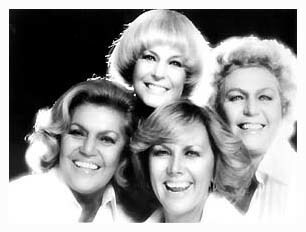 They also had sizable hits with "I'll Get By", "The Hut-Sut Song", "San Fernando Valley" and "Candy". Donna King reflects, " We never really had any big, big hit records, but there were some moderate-sized hits. The problem was, we never had very good management and that really held us back. Also, we were too smart, we thought we knew everything. I mean, we had our own ideas about how our career should go, and I think that also stood in our way. If we had been able to put ourselves in someone else's hands, who had a real career plan, I think we would have been a lot more successful." The King Sisters landed a seven-year contract with MGM in Hollywood, and appeared in pictures for other studios, as well. Like a lot of the other successful vocal groups of the forties, the King Sisters made their share of mostly forgettable B-pictures with titles like Cross Your Fingers (1941), Sing Your Worries Away (RKO - 1942) - Starring June Haver, Buddy Ebsen and Bert Lahr, Larceny With Music (1943 - Universal) - Starring Allan Jones and Kitty Carlisle), Follow The Band (1943), Meet The People (1944), Cuban Pete (1945) Starring Desi Arnaz, and On Stage Everybody (1945) with Jack Oakie and Julie London. Occasionally one of these still turns up on the late, late show. "Our contract with MGM fell through because our manager at the time was Billy Burton, who was also Jimmy and Tommy Dorsey's manager," remembers Yvonne King. "He got into a big fight with MGM about some problem he was having with Tommy and Jimmy's MGM contract, and he ruined our own movie contract by telling them, 'and besides that, the King Sisters don't like their deal either!' Of course, we were shocked and obviously very disappointed! But we were so young and naive that we just went along with it, and that was that." During the summer of 1944, they were the resident vocal group on Kay Kyser's radio program while their husbands completed their tour of duties with the armed services. 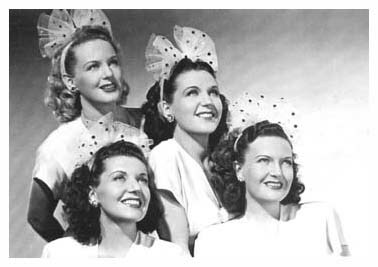 Like other stars of the day, the King Sisters did their part for the war effort and toured countless military bases, and appeared on wartime radio programs created especially for the servicemen, such as G.I. Journal and Mailcall. In 1946, their contract with RCA Bluebird ended and the Kings signed briefly with Mercury Records. At the war's end when Rey re-formed his band, Luise King was by her husband's side, playing harp in his new organization, while youngest sister Marilyn temporarily filled in to complete the King Sister's foursome, which remained a separate act. Marilyn had pinch-hit with the King Sisters' act off and on since she was 12 years old. Whenever Donna, Yvonne, Alyce or Luise was sick or busy delivering babies, little sister Marilyn was ready and more than eager to fill in. Also, during 1944, the sisters fulfilled a life-long dream since their high school days to own their own dress shop. They had always been 'clothes-conscious' and many a night, while sitting on the bandstand with Alvino, they would scrutinize the dresses worn by the girls dancing by. 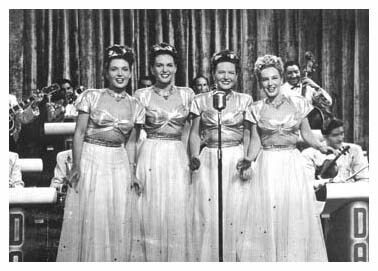 They had designed many of their own stage clothes with the help of their eldest sister, Maxene, a talented seamstress. They opened 'Valley Vogue' in Studio City, California, both to fulfill this long-standing dream, and as an financial investment. The shop was run by a friend who went on regular buying trips to New York City. 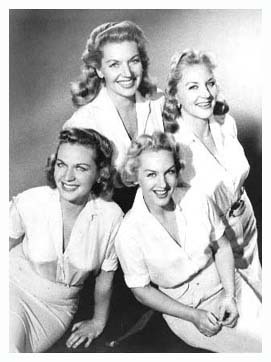 Throughout the end of the forties and into the fifties, the King Sisters were regularly featured on numerous local and national television shows of the day both in New York City and Los Angeles. They officially dropped the 'Four' from their name and billed themselves once again as simply 'The King Sisters'. In 1952, Les Paul And Mary Ford had a big hit with Tiger Rag, copying the special lyrics that Luise King had written for the King Sisters's own 1941 recording. But as for their own career, during the early '50s, the King Sisters for the first time, found themselves without a recording contract. Meanwhile, they had been re-vamping their act and had developed a 'new' King Sisters sound. They lowered the keys of their songs, began articulating the words clearer, and featured more unisons. Also, more time was spent selecting sophisticated, classy material. 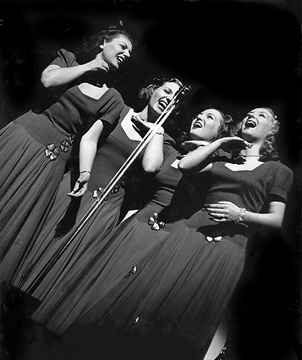 The Sisters had felt a need to 'update' the act, after having shared the bill with the Four Freshmen, a then-new vocal group that was having major success with an extremely jazz-oriented sound. In 1957, Alyce King arranged a meeting between the King Sisters and their old friend, Glen Wallichs, who had been one of the co-founders of Capitol Records. They played him a tape from several CBS radio shows they had done, and he loved their new sound. "Glen said the problem would be that the A&R people at Capitol probably wouldn't bother to give the tape a listen," says Yvonne King, "because they already thought they knew our work and they wouldn't even give us a chance. So what he did was take the tape in to Capitol, and told them that he'd just discovered a new group, and then he played them that tape. Of course, what happened was that the people at Capitol went nuts over the tape and wanted to sign us right up!" Yvonne recalls, "a review for the Imagination album came out in Esquire Magazine and said that we were an up and coming new group! That really tickled us. Here, we had been around for almost 30 years, and suddenly we were an up and coming new group! We really got a big kick out of that. We had started working with a vocal arranger named Roy Chamberlain, who was a man of extremely good taste. He did all the vocal charts for Meredith Willson, and he worked with us on all of our Capitol records." Their single of 'Imagination' was a substantial-sized hit on the 1958 charts, and they continued to record singles and albums for Capitol until 1960. During this period, the King Sisters slowed down their out-of-town performances to be able to spend time raising their children. And boy, did they have children! Between the six sisters, 18 kids were born. The King Sisters' two brothers added to the collection with 6 of their own children. During the fifties, Donna and Jim Conkling moved back East, and 'baby sister' Marilyn permanently stepped in to round out the King Sisters' quartet. This is the combination that recorded for Capitol in the late '50s and early '60s. The King Sisters continued to perform in Las Vegas, Lake Tahoe and some of the top rooms across the country. As a side project during 1964, Marilyn King worked behind the scenes on the film version of The Sound Of Music, supplying the singing voice of one of the nuns, and still receives royalty payments each time the film airs. Also in early 1964, Yvonne King organized a series of benefits for their church and for their father's alma mater, Brigham Young University, which included not only the King Sisters, but also included the members of their families, which now numbered over 40 people. The audience response to these family concerts was tremendous and each time they performed the show, the audience responded with standing ovations. Yvonne knew they were on to something good, and personally showed a videotape of one of the performances to the head of ABC-TV. He loved it. "What I had put together later became known as 'The King Family', " says Yvonne, "and in terms of popularity, it was definitely the biggest thing to ever happen to the King Sisters. We'd had so many disappointments in our careers that my sisters never really thought The King Family Show would ever get on the air. But I really believed in it and fortunately, so did ABC." The Kings formed their own production company called KingFam Productions, which was run by Yvonne King and her husband, announcer Del Courtney. The King Family Show debuted in January of '65 as a winter replacement series, and ran until January of '66. The variety show had something to appeal to all ages, and while it was sometimes dismissed by critics, the public loved it. "It was a lot of hard work," Yvonne King remembered, "but oh, we had such great times doing it." After more than 30 years of performing, the King Sisters were finally publicly acknowledged for their talent and showmanship, and got to show off their talented family, as well. In a way, the shows were a full circle return to the family orchestra that the King Sisters themselves had been a part of as children. The powers that were at ABC never had to look very far for talent, with 37-41 members in the family, (depending on who was in town), ranging in ages from 3 to 76, and included the King Sisters' husbands, children and parents. They also continued to appear on other show, including The Hollywood Palace. During one of their 1965 Hollywood Palace appearances, William King Driggs suffered a stroke while on the air with his family. Always the trouper, he never missed a beat, and it wasn't until the cameras stopped rolling that he collapsed. In his dressing room, he individually called each member in from his large family to say goodbye. He died a short time later, in the ambulance en route to the hospital. 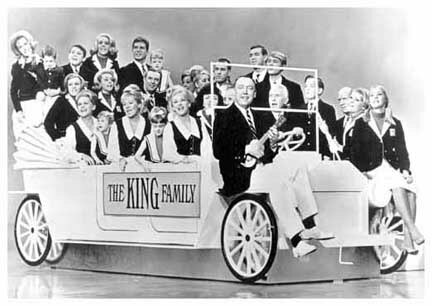 Several King Family albums were released on the Warner Bros. label during the run of the show. When ABC dropped the show in late '65, due to low Neilsen ratings, more than 200,000 letters of protest poured into the network. Reportedly, at that time, it was the largest amount of mail received concerning any canceled program in the history of television. Photographs appeared in the press of The King Family surrounded by sacks and sacks of the supporting mail. Officials at ABC were caught totally off guard, and were left amazed and somewhat embarrassed by the huge response. The program had an intensely loyal following that even the powerful Neilsen ratings couldn't detect. A series of one-hour specials followed, and in March of 1969, the series was briefly revived. 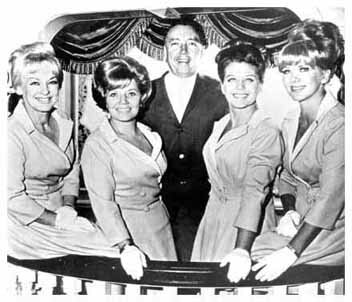 The show featured the sisters' children, 'The King Cousins', who had previously sung on the soundtrack of the film, Bye Bye Birdie. One of the cousins, Alyce King's son, Lex De Azevedo, became a successful record producer in the 60's, and among others, he discovered and produced Mrs.. Miller, a singer so bad, she became a hit. In the 70's, he was a musical director on The Sonny And Cher Show, and in the 80's he worked with Michael Jackson as a musical director. He more recently has composed the music for the animated feature, The Swan Princess and has made a name for himself as a conductor and writer of religious musicals. One of Alyce's other sons, Cam Clarke, is now one of Los Angeles' top voice-over announcers in radio and television, and provides voices for current Saturday morning cartoons. At the center of The King Family Show, featured prominently, were the King Sisters themselves. Their performances brought a polish and solid professionalism to the series that more than 30 years of show business experience had earned them. The show provided wholesome, family entertainment that although ridiculed by some, was a relief to many from the social and political turmoils of the '60s. The show also made the King Family a household name, and long after the show was off the air, the name 'The King Family' would frequently turn up in one of Johnny Carson's Tonight Show monologues. "I think our harmonies were probably a little too complex for the average listener. The musicians who heard us, I think were impressed with us. But our harmonies were voiced like a horn section. I think the public could understand the simpler, three-part groups like the Andrews Sisters and the McGuire Sisters a little easier. "Also, we had lots of opportunities to make major career moves that definitely would've made the King Sisters more successful, but we always followed our hearts and did what we thought was right for our families. Some of these other groups who were more successful, haven't spoken to each other in years, have sued each other and have had all sorts of problems. I wouldn't trade what we have now for anything in the world, which is all our family who support and really care about each other." 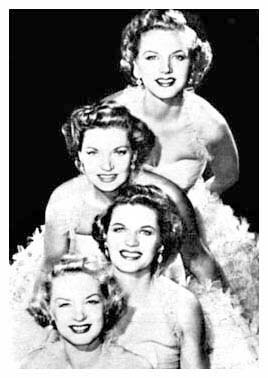 After the King Family stopped performing, the King Sisters themselves, kept as busy as they wanted, performing with Alvino Rey at Disneyland and Knott's Berry Farm , state fairs, trade shows and on package tours across the states with other swing era stars until the mid-1980's. They were one of the featured entertainers at Ronald Reagan's 1985 Presidential Inauguration Ball. Even in their later performing years, the King Sisters projected plenty of personality and a youthful enthusiasm that audiences loved. Towards the end of their lives, the sisteres remained active in music, and spent much of their time organizing musical functions at their churches and at their grandchildren's schools. Their careers have spanned over 60 years. Alvino Rey and Luise King Rey celebrated their 60th wedding anniversary in 1997, the same year that Luise died after a protracted bout with cancer on August 4th, 1997. Alyce King (Clarke) passed away on August 23, 1996, following a long history of repiratory problems. Donna King (Conkling) lived in Sacramento for many years, until the death of her husband Jim Conlking, (who passed away on April 12, 1998). Alvino Rey lived to be 95 years old, and he passed away on Feb. 24th, 2004. Donna King Conkling passed away on June 16th, 2007. Oldest sister Maxine Drigg Thomas died on May 13, 2009 in Corona, CA at the age of 97. Yvonne "Vonnie" Burch King passed away on December 13th, 2009. The last remaining King Sister, Marilyn King died in Los Angeles, CA on August 7th, 2013. Currently, modern day vocal groups like the Manhattan Transfer are unabashed King Sisters fans, and out of admiration faithfully perform their arrangements in their concerts. In the spring of '95, Capitol Records released a fine CD, as part of their 'Spotlight On...' series, highlighting The King Sister's work for the label. Since then, many other King Sisters' CDs have come out, including some from British labels. 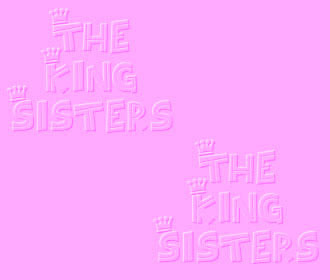 Please visit the official King Sisters Facebook page here. All rights reserved by author/No part of this article may be reprinted without written consent of the author.